Third Coast Sports – www.thirdcoastsports.org – is a company I started with my good friends Mike Snider and Lynn Golden back in 2004. We put on Faith Day events with professional baseball teams all over the country. A Faith Day consists of a full concert by a nationally recorded Christian artist and a testimony from at least one of the home team’s players. We do all of this on the field right after the game is over. It takes about 22 minutes to roll everything into position once the final out is recorded. Since 2004 we have done more than 300 events with 75 teams. Some of the team executives have shared with us that Faith Days are their number one promotion of the entire season. They see bigger crowds on Faith Days than when they’re having fireworks, bobblehead doll giveaways or any other theme nights. Over the last couple of years, some of the teams we’ve worked with for six and seven years now have reported advanced group sales of as much as 25,000 tickets for a single game. Some of the bands we’ve worked with include MercyMe, Jeremy Camp, Casting Crowns, Third Day, Steven Curtis Chapman, David Crowder Band and Jars of Clay. Some of the professional baseball players who have given their personal testimonies at our events include Albert Pujols, Josh Hamilton, Lance Berkman, John Smoltz and R.A. Dickey. 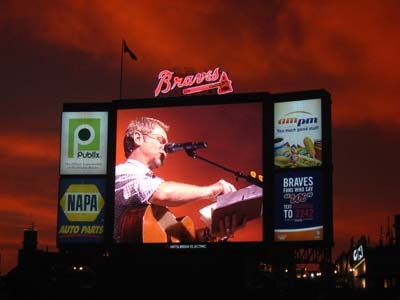 In 2010 I got to give my personal testimony at Turner Field as part of the Atlanta Braves Faith Day. Click here to watch.